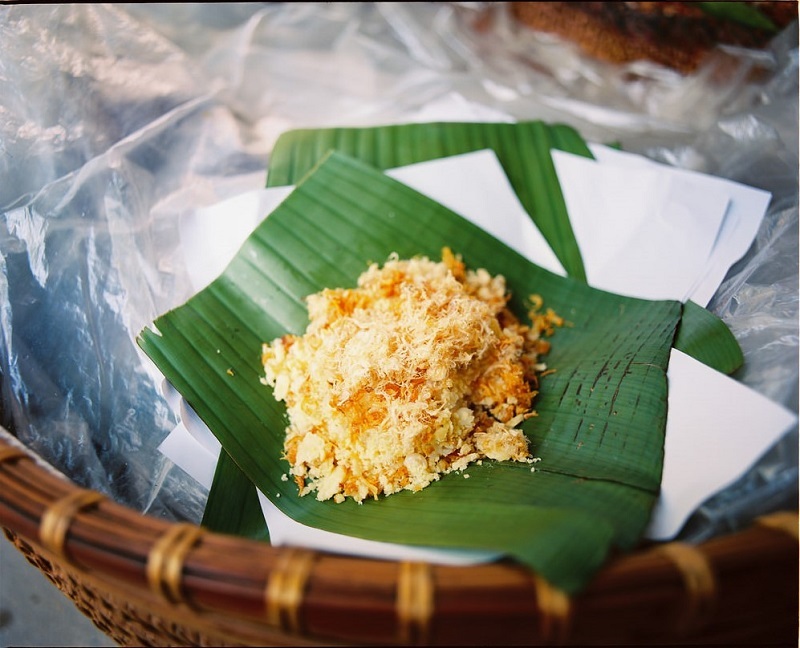 There is nowhere in Vietnam that so many types of sticky rice - or “xoi” present like they do in Hanoi. But standing out among the various kinds, “xoi xeo” is not only creative art with a sophisticated combination of ingredients and color but the sophistication even leaks out to its odd name. Amazingly attractive with its bright yellow color, “xoi xeo” is sold in every wet market or may even be right on the street corner early in the morning. The seller keeps “xoi xeo” warm in a bamboo basket which is carried on the shoulder or fastened behind the bicycle. “Xoi xeo” is a special dish for breakfast, especially with students and manual laborers thanks to its rather low price, its fulfillment and palatability. “Xoi xeo” is regarded as one of the hardest-to-cook “xoi”, despite the fact that it is concocted from ingredients which are very popular and familiar with Vietnamese. The ingredients for making “xoi xeo” remain the same everywhere: glutinous rice, turmeric powder, mung bean, shallot, and some liquid fat. The turmeric powder, mixed with water and glutinous rice, will create the natural yellow for the dish. Mung bean, after being carefully chosen and peeled; is steamed, pummeled and then rolled into small balls. Travellers are often amazed at the sight of the seller skillfully smashing the balls inside their palms, covering the base with yellow thin layers of bean. On top of the portion lays brownish crunchy deep fried shallot. To complete the taste of “xoi xeo”, the seller will add a tablespoon of liquid fat. The yellow of the turmeric rice and bean, the brown of shallot, the distinctive green of banana leaf mix and match perfectly, and combine to make an eye-catching “xoi xeo”. Some people, especially children, like eating “xoi xeo” with a lot of mung bean or fried shallots, while other may enjoy theirs with lot of “ruoc”- smashed and fried salted pork. A warm large portion of “xoi xeo”, wrapped in banana leaf and old newspaper, first thing in the morning, which runs for a mere 5000-7000vnd can keep one full until late noon. In the cold weather, a brazier is used to prevent the oil from being frozen. “Xoi xeo” is an exceptionally favorite dish in winter because the bright yellow colour and liquid fat make people feel warm and cheerful. Nobody knows where “xoi xeo” came from and why it has such a weird name “xeo”, as “xeo” is used as an impolite way of telling people to go away in Vietnamese. Abnormal as it is, “xoi xeo” is still a unique part of Hanoi’s cuisine that is loved by many people, both locals and foreigners.